This group of people is also known as Celts or Selts. Kelts are members of a group who spoke various forms of the Aryan language known as Keltic, or Celtic. People were identified as Kelts because of the language they spoke rather the race to which they belonged. 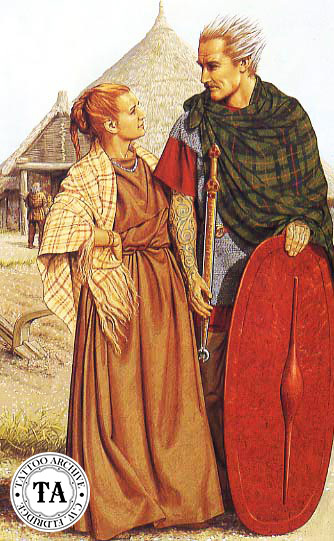 Ancient Kelts were famous for their wit, their love of liberty, and their bravery in battle. They were also known for using bronze weapons. Little is known of the Kelt's early history. Found mainly in southwestern Germany, they soon spread over most of Western Europe and were the first invaders of England around 800 BC. The Kelts invaded England, an invasion which lasted several hundred years, overwhelming the Stone Age man. One group of the Kelts, the Gaels established their language and culture in Scotland and then crossed to Ireland. Another group, known as the Britons, occupied most of the areas now known as England and Wales. The Kelts gradually became mixed with other races. Eventually, they were destroyed by the Romans or by the barbarians who later rose to power in Europe. In the end, only the Kelts in Ireland, Britain, and Brittany remained. It is well known that the Scythians, who occupied the lands west of the Carpathians Mountains, had many influences on Keltic culture. Body decoration, dress and methods of warfare were some of these influences. In a project started in 1947, Soviet archaeologists unearthed the frozen body of a 2,000 years old Scythian warrior. This body was well tattooed with fanciful animal designs. The Kelts, and later the Britons, were into body decoration and this may explain the early spread of tattooing into England.